We study crystalline scintillators and we apply these scintillators to various fields such as nuclear medicine, high energy physics, astro physics, oil well-logging and homeland security. [news!] 10th Anniversary party of Yoshikawa Lab. will be held on 22nd July (Sat.) 3 p.m.
2017/7/1-7/8 Prof. Kurosawa and Mr. Kodama had a business trip and performed experiment in AS CR (Czech) for collaborative research. 2017/7/1-7/7 Prof. Kamada and Prof Kurosawa attended and had a presentation at NDIP. 2017/6/27 Prof. Kurosawa attended ceremony of the NEDO energy saving project. 2017/6/26-7/5 Prof. Yoshikawa and Prof. Kamada had a business trip on Tenerife,Spain for collaborative research. 2017/6/26 Mr. Kodama was accepted in international exchange of Marubun foundation. 2017/6/23 Prof. Sakemi (The University of Tokyo) visited for collaborative research. 2017/6/23 Prof. Kamada had a business trip on Tokyo. 2017/6/23 Prof. Yoshikawa attended to post-evaluation meeting of the JST A-step practical application project. 2017/6/22 APL visited for collaborative research. 2017/6/21 Prof. Kurosawa visited Hamamatsu Photonics K.K. for for collaborative research. 2017/6/20 Prof. Yokota had a business trip on Fukushima. 2017/6/19 Dr. Shimazoe (The University of Tokyo) visited for collaborative research. 2017/6/16 Dr. Iida visited for collaborative research. 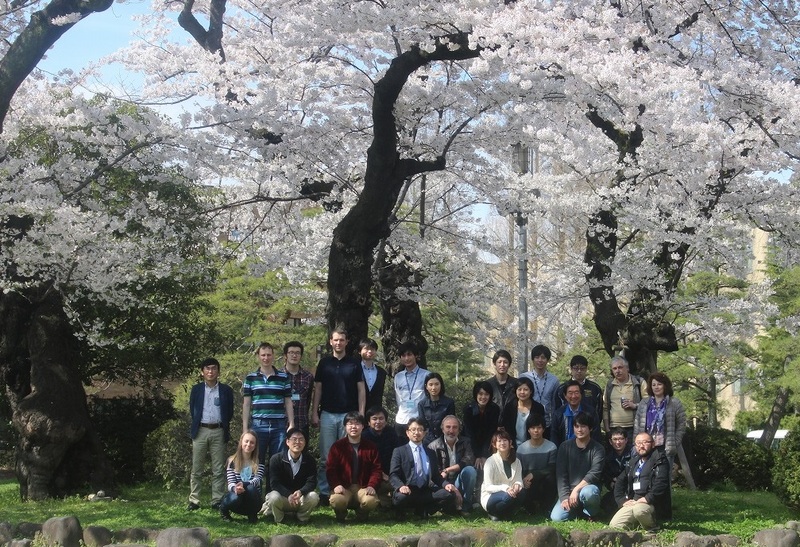 2017/6/15 Prof. Yokota attended at board meeting of the Japanese Association for Crystal Growth(JACG) (Kyoto). 2017/6/9 Mr. Horiai and Mr. Kodama had a business trip on Yamagata University for collaborative research. 2017/6/7 Prof. Kamada a business trip on Tokyo. 2017/6/7 Prof. Kurosawa was accepted in MST fund and attended at the award ceremony. 2017/6/5 Mr. Kodama was accepted in Murata science foundation. 2017/6/2-6/30 Prof. Weerapong and students visited for collaborative research (ICC-IMR project). 2017/5/31 Prof. Yoshikawa, Prof. Kamada, Prof. Kurosawa and Ms. Sasaki attended the 186th Committee of the Japan Society for the Promotion of Science (JSPS). 2017/5/31 Prof. Kurosawa had a meeting with Prof. Yoshino (Nagoya University) for collaborative research. 2017/5/26 Pfor. Kurosawa had a business trip on Institute for Molecular Science. 2017/5/23 Sanko-sha company visited for collaborative reseach. 2017/5/21-23 Prof. Kurosawa attended and had a presentation at 2017 Symposium on "Revealing the history of the universe with underground particle and nuclear research". 2017/5/21-26 Prof. Yoshikawa and Prof. Yokota attended and had a presentation at PACRIM. 2017/5/16-17 Prof. Sekiya (ICRR, University of Tokyo) visited for collaborative research. 2017/5/15 Dr. Yamaji won the 42nd incentive award on JSPS Spring Meeting, 2017. 2017/5/12 Prof. P. Veber (University of Bordeaux) visited for collaborative research and stays until 19th, May. 2017/5/12 Prof. Yokota attended the 161 Committee of the Japan Society for the Promotion of Science. 2017/5/12 Mr. Horiai had a business trip on Yamagata University for collaborative research. 2017/5/11 Prof. Kurosawa had a business trip on Tokyo. 2017/5/10 Prof. Kurosawa attended and had a presentation at Photonic and Quqantum beam joint symposium 2017. 2017/5/8-12 Prof. Yokota attended and had a presentation at IEEE International Symposium on Applications of Ferroelectrics (ISAF). 2017/5/2 Industrial Technology Institute, Miyagi Prefectural Government visited for collaborative research. 2017/4/28 NEDO "Program for strategic Innovative Energy Saving Technology" (collaborative research) was accepted at FY2017. 2017/4/27 Pfof. Kurosawa had a business tripn on Tokyo. 2017/4/26 Welcome & Farewell Party was held for foreign researcher. 2017/4/25 Prof. Kamada and Prof. Kurosawa attended at workshop on dark matter. 2017/4/24 Hamamatsu Photonics K.K. visited for collaborative research. 2017/4/24 Dr. Iida visited for collaborative research. 2017/4/21 Prof. Pejchal and Dr. Bartosiewicz (CAS, Czech) visited for collaborative research for JSPS Bilateral joint reserarch project, INTELUM project and ICC-IMR project (3 months). 2017/4/21 Press release about "Piezo Studio", which is the venture company from Yoshikawa Laboratory, was anounced. 2017/4/21 Prof. Kurosawa attended at the 2nd Laser Neutron Source Utilization Technical Committee. 2017/4/19 Prof. Kamada had a business trip on Tokyo. 2017/4/18-20 Dr. Yamaji attended and had a presentation on OPIC2017 CLES/LANSA'17. 2017/4/18 Pre-defense of doctral thesis (Middle stage) of Mr. Yoshino was held. 2017/4/17 Dr. Yamanoi (Osaka Univ.) visited for collaborative research. 2017/4/17-19 Dr. Ogino (AIST) visited for collaborative research. 2017/4/15 Hanami party was held. 2017/4/12 Sankosha visited for collaborative research. 2017/4/11 Progres meeting of NEDO:Strategic energy saving technological innovation program was held. 2017/4/11 Prof. Sarukura (Osaka Univ.) visited for collaborative research. 2017/4/7 Welcome party was held for new Master and Doctor course students. 2017/4/5 Prof. Kurosawa, Dr. Yamaji, Mr. Horiai and Mr. Kodama visited to Kyoto University Research Reactor Institute (KURRI) for collaborative research. 2017/4/4 Teachi-in program was started. 2017/4/3 KAKENHI (Grants-in-Aid for Scientific Reserch) were accepted. 2017/4/1 FY 2017 start ! Mr. Takasugi and Mr. Yamato join our Lab.